Discussion in 'Shot Placement' started by AfricaHunting.com, Dec 17, 2008. 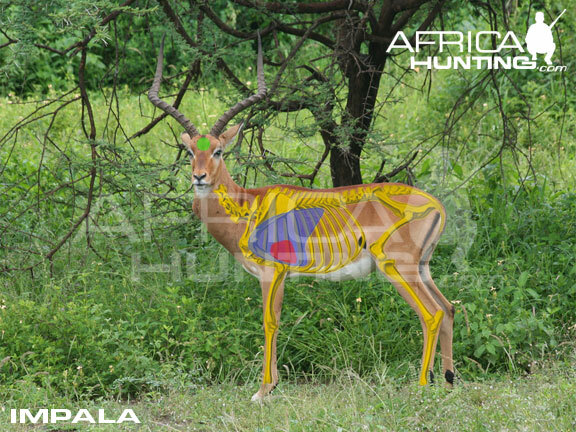 A good centered shot right in the front shoulder will make these Impala's very sick, very quick! There isn't to much tracking if hit properly!!! And talk about some tasty meat!!! I have no idea where all this confusion came from other than from someone attempting to be a self imposed expert on shot placement and couldn't find anything to write about..I guess its a pet peeve of mine. Impala have a built in target...right where the colour change occurs! I'd say that's true on some plains game but on others their anatomy is downright confusing. You will never go wrong holding lower and further ahead than you do on North American game. Thanks for posting these attachments on several threads about hunting different animals. Which country is this law set up in? To give a general idea of what is needed for the similar size animals? Which country is this law set up in?